You’re sick. Should you go to the gym? How do you work out around an injury? Obviously you want to “do what you can,” but the fact is, our minds play tricks on us, and you have to make sure you’er not just prolonging the sickness/injury or causing more damage in the long run. In this episode Scott, Kevin and Mike tackled these questions from a few different angles. Don’t go to the gym if you’re going to infect everyone! Be considerate! A large part of it is knowing your body: what will help, what will just prolong how long it takes to recover? At the same time, don’t use sickness as an excuse. Remember that pain is usually trying to tell you something. Scott noted that it’s amazing how many record-setting performances have been done when someone had a cold, or flu, or some injury that should have prevented them from doing that. Self-fulfilling prophecies can work for you or against you. If you believe you’re too sick to work out, you will be. If you believe you “never get sick” — well, that doesn’t make you invincible, obviously (c’mon, let’s be real) — but it will have an effect. Chills or fever are usually a sign that you are sick. Not just “a stuffy nose” — but truly sick. One of the best things you can do is focus on sleep. The body adapts to the stresses you subject it to. For example, think of high-performing politicians who deal with a tonne of stress, get very little sleep, travel around the globe 80% of the year, and so on. Neither Scott, Kevin, or Mike would do well with that kind of job. But someone like Trevor Timmins makes it work. There were a number of allusions to high performance athletes and politicians. On the one hand, some politicians (e.g. the freaking President) do amazing thing in terms of how they handle time and stress and lack of sleep; on the other, research is clear about things like the importance of sleep, and 95% of people who say, “Oh, I thrive in such-and-such an environment” are actually lying to themselves. At the end of the day, as Kevin said, your job demands what your job demands. Abelism: You own stress, or stress owns you. Don’t fall into the “why bother?” mindset, even if that’s where our brains want to go. It’s more important to do what you can. Kevin had a serious knee injury and did what he could “around” the injury, and went on to win a bunch of powerlifting competitions. You will get better. Just do what you can. Working “around” an injury means listening to you body. So much is dependent on your body, and your muscles, that there is no one-size-fits-all prescription, such as “Oh, you tore your ACL, as soon as you’re able, just do squats this way.” No. Maybe you just need to leave squats out for longer, or you need to do them some other way. It depends, and it’s always different. The only way to figure it out is to experiment (within reason). There is almost always a way to work around different injuries, especially as you get closer and closer to being 100% again. For example, Kevin had a torn meniscus, but simply modifying his foot position (to make his shin more vertical) helped with bulgarian split squats. At the same time, he wouldn’t dictate to a client that this was the only way to do them, in order to make the exercise work. 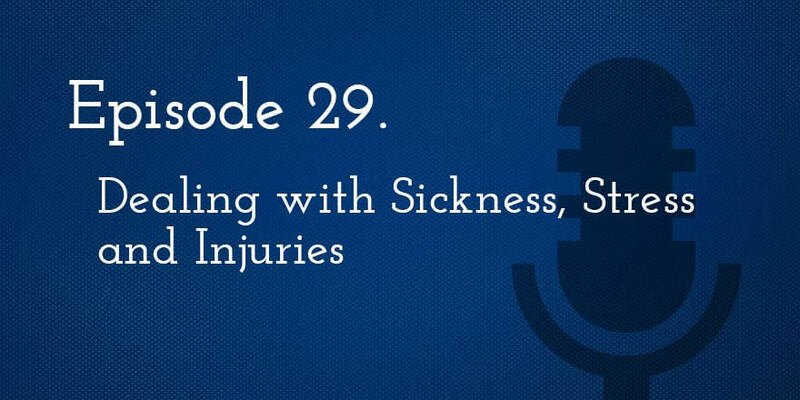 You need to figure out what works in your specific injury situation. Throughout the episode Scott’s “Base Hit” strategy was referenced. Click the button to download the 3-part article series.